The Valentini Puffer fish is an awesome fish to keep. It is fairly easy to care for, but does have some specific compatibility constraints to be aware of. It is also often known as the Saddle Valentini Puffer, Valentini’s Sharpnose Puffer, Valentini Puffer, Saddled Toby, and Black Saddle Puffer fish. Where is the Valentini Puffer Found? Are Valentini Puffer reef safe? What do Valentini puffer fish eat? Are there any puffer fish that are reef safe? 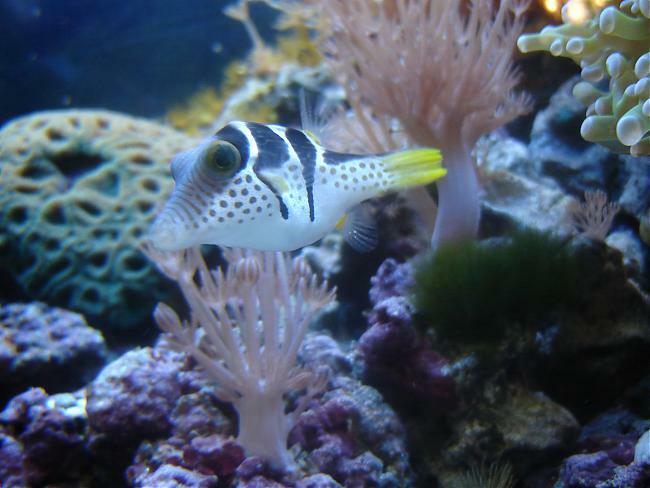 What type of behavior can you expect from a Valentini Puffer? How do Valentini Puffers reproduce? What are some good Tank Mates for the Valentini Puffer? Does the Valentini get all puffed up? Are Valentini Puffer fish poisonous? What is the Lifespan of a Valentini Puffer? Where are Valentini Puffer found? The Valentini Puffer is actually found in many tropical locals including Eastern Africa, Asia, Australia, and Hawaii. 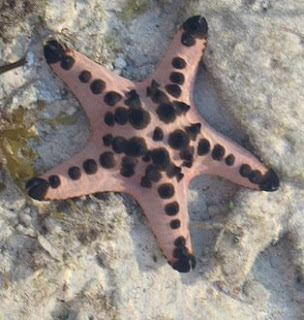 They like to inhabit rocky subtidal lagoons as well as reefs up to about 150 foot deep. 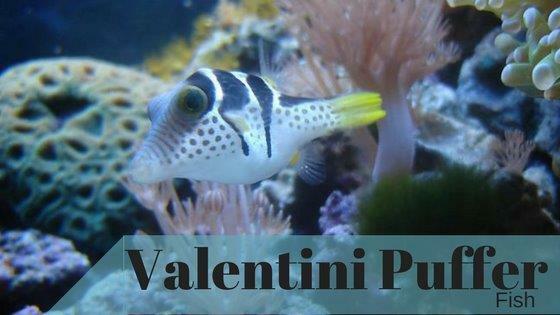 Valentini Puffers are not as a rule of thumb reef safe. That is primarily because of their diet. If you don’t mind regularly replenishing your cleanup crew than you can give it a shot. Do so with caution though, for every person that says they have done so with no issues of it eating coral, there is another that tells how they nipped and grazed on coral. I would not personally, but if you do give this a try make sure you keep a regular supply of snails in the tank for feeding and you feed a regular supply of meaty food as well. Also try this with very hardy specimen such as mushrooms, xenia, green star polyps, and leathers. Valentini are omnivorous and enjoy a meaty diet in addition to grazing on your algae. They will feed on chopped and frozen meats like fish, scallops, shrimp, squid, and clam. Having a ready supply of snails or other hard shell invertebrates is recommended. The Valentini’s teeth will continue to grow forever, so having some hard shell creatures to munch on will help to keep them filed down. Without this to help keep their teeth in check, they can reach a point where the fish is not able to eat properly and will die of starvation. Due to their eating habits, there are no puffer fish that are, to my knowledge, 100% reef safe. That said I have seen many instances where people post stories to forums about how they have had puffers in a reef tank for years with little to no impact on coral. They even talk about them not bothering a large portions of their invertebrates focusing mainly on snails. If you want to give it a try the Valentini Puffer is one to look at others are the Saddle Puffer, Blue Spotted Puffer, and the Central American Sharpnose Puffer. Again, do so with caution and close supervision. This is one of those things where it really just depends on the fish you get and its individual personality rather than a species generalization. Puffer fish as a whole are a more sensitive species of fish. They should definitely be drip acclimated. Setup a bucket or bowl housing the puffer fish in the water it came in but with enough room for a good bit of water to be added. Take water from your tank and slowly drip it into the bucket. This causes the water parameters in the bucket to gradually match the water in your tank. Allow them to drip for a couple hours to be safe. When moving the puffer fish from one tank to the other, do not pull the fish out into air. Puffers are susceptible to ingest the air and have a more difficult time releasing it than other fish do. Do not use a net with puffer fish. Netting a puffer fish is sure to cause its puffer instincts to kick in which can cause the fish harm while in a net. Instead capture it in a hard shelled container when transferring from one tank to another. 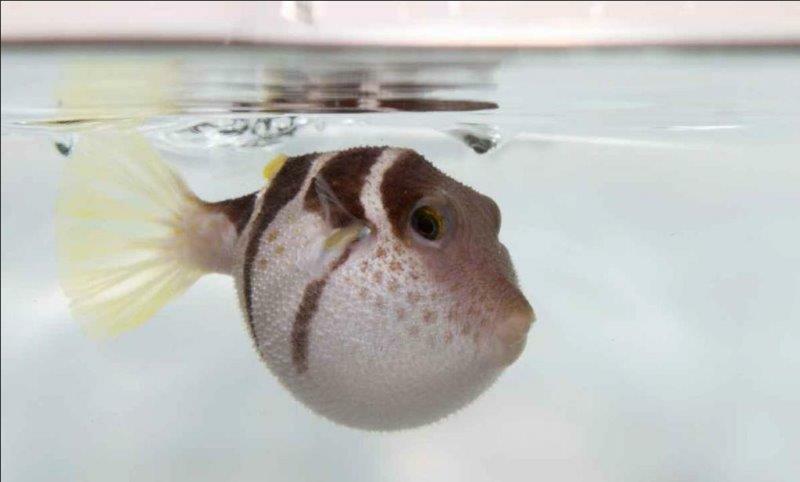 Like all puffer fish, Valentini have a ton of personality. It lacks pelvic fins and uses its pectoral fins to move giving it the stereotypical puffer movement. They will spend most of their day grazing on algae and are typically nocturnal hunters. They are curious fish though and will nip at fins and equipment. Breeding in aquariums is not common place but can happen. The female will lay eggs on a flat rock or surface and the male will fertilize them. The male will then guard them for the 4 days (approximately) until they hatch. Upon hatching his parenting is done and the young fry are on their own. Adult males tend to be larger than females. They are identified by the presence of thin, turquoise lines starting on their head. These turquoise lines will continue down their back. Mating Valentinni’s sharpnose puffers from Nick Turner on Vimeo. Valentini are known nippers. It may just be curiosity or aggression but they will nip at the fins of other fish. Any fish with long flowing fins are not recommended. Some good fish to house them with are Angels Large and Dwarf, Anthias, Butterflies, Cardinals, Clowns, Gobbies, Groupers, Hawkfish, etc. Some tank mates to be careful with are Anglers, Basselets, Boxfish, Dartfish, and Groupers. Not to say they can’t be kept with these but pay attention to how the two individuals get along after introducing them to the same tank. Yes, when alarmed Valentini can inflate to twice its normal size. This is not healthy for the fish and should not be encouraged behavior though. It should rather be a sign of when you need to leave it alone. Valentini Puffers contain a poison in their flesh called tetrodotoxin. If the poisonous portions of the fish are consumed it could be deadly. This is a natural deterrent for predators in the wild. 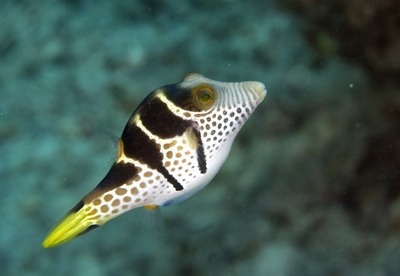 So much so that the Saddled Filefish (Paraluteres prionurus) have naturally evolved to look like the Valentini Puffer as a deterrent even though they themselves are not poisonous. If your Valentini should die, remove its body from your tank immediately. Many fish are known to feed on dead fish in the tank and with this one being deadly it should be avoided. These puffer fish have been known to live 5 to 10 years. Ensure that your tank parameters are well maintained; you give a consistent diet including algae, meaty bits, and hard shell creatures to munch on and these fish will live a long healthy life. It is recommended to keep these fish in no less than a 30 gallon tank. They are a small fish, but they do need room to swim. Also since they get a large portion of their diet from grazing on algae a tank with enough surface area to grow sufficient algae is needed. These are an awesome addition to a fish only with live rock (FOWLR) tank. Keeping them with other fish that do not have big flowy fins is best. Expect to replenish your cleanup crew regularly as most will eventually become fish food. That means don’t go for the expensive invertebrates. Stick to the cheap replaceable ones. Finally be mindful of keeping these with any coral as you do so at your own risk. What are your experience with this fish? Let me know in the comments below. We’ve had our valentini now for around 2 years. He doesnt seem to touch any of the corals in the tank. Hard or soft, however we have lost a couple of crabs and a fire shrimp. My new boxer shrimp however more than stands his ground and see’s off the puffer if he goes near him.